Taking a screenshot in New Leaf is simple: press L and R at the same time. Boom. You've got a picture. Great! Getting those pictures off your 3DS, while simple, requires a few more steps. Nothing too complicated, though. 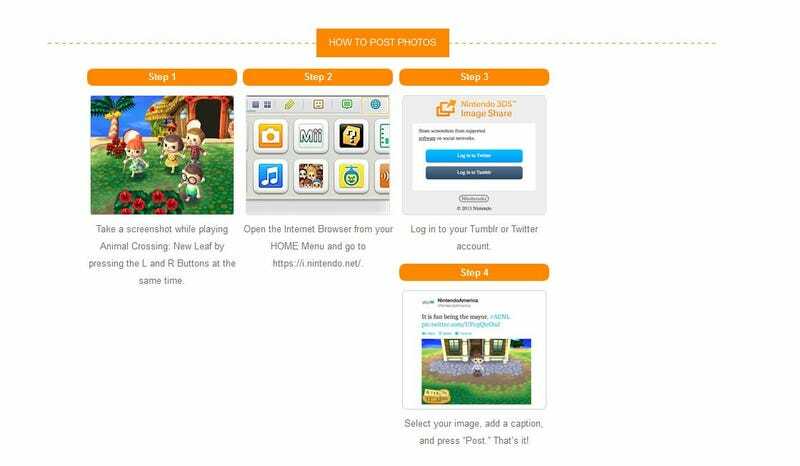 The image above, which details the process, is from Nintendo's website—you can find that here. Putting it in words, basically: take a screenshot. From there, use the 3DS' internet browser, and visit this website. There, you have to log into either Twitter or Tumblr. Once you do, a menu comes up that allows you to post your pictures; in my experience, Tumblr only allows you to upload one picture at a time. I assume Twitter does the same. Kind of cumbersome, sure, but the pictures aren't so big—uploading shouldn't take more than a few seconds. Be warned that whatever you upload automatically has the #ACNL hashtag attached to it. If you don't have a Twitter or Tumblr, the next best thing is to pop out your SD card and put it on your computer somehow—like, say, by using an SD card reader. Either way, hopefully you're taking plenty of pictures and sharing them with the world: much of the fun in Animal Crossing involves showing other people what you've done. Now get out there and take some good pictures. Tomorrow, we're giving you a chance to show us your home in New Leaf—better go tidy up!